Mooting team comes in for high praise from Grand Final judges and wins prize for best written submission. 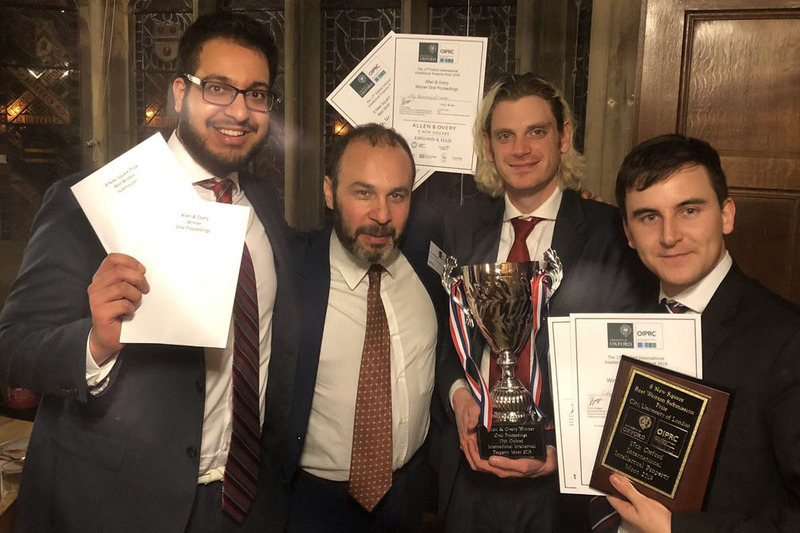 The City Law School has won the 2019 Oxford International Intellectual Property Moot. The mooting team, comprising Piers Digby, Asfandyar Qureishi and Thomas Mallon - all studying on the Bar Professional Training Course (BPTC) - also received the Best Written Submission Prize. The Intellectual Property Moot is held annually in Oxford over three days in March. It is hosted by the Oxford Intellectual Property Research Centre and organised by the Moot committee. The Competition invites teams from universities around the world to prepare written submissions and present oral argument on each side of a hypothetical intellectual property law problem set by experts in the field. This year's competition took place on the 14th, 15th and 16th of March. Over 30 universities were involved in the competition, including the University of Ottawa, whose team emerged runners-up. The question for the 2019 Oxford IP Moot focused on trade mark law. It involved the fictitious country, Shangri-La, and the registration, in Erewhon, of a mark containing Shangri-Lese characters alongside an English word. The moot revolved around an allegation of trade mark infringement in relation to that mark. We are very pleased with the result achieved by our team which spared no effort in solidly preparing its arguments against all of its strong and formidable opponents. Our success confirms the talents and advocacy skills developed and taught at The City Law School. We are particularly honoured by the high praise our mooters received directly from the stellar judges of the Grand Final, Lord Kitchin, Lord Justice Floyd and Mr Justice Carr. I am very proud of Piers, Thomas and Asfandyar. Well done!